Below left is what you'll see when you open Croft Weaver. Below right is the result of clicking on a few green crosses to bring up more line entries. Below left. If you click on the white box at the right of the first line, you'll bring up a simple colour palette. Click on the colour you want and then move down to the next white box and repeat the action. Below right shows our choice of the first colour. Left. 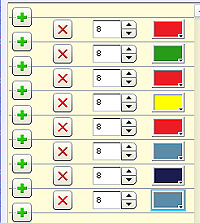 We've now clicked on each of the empty white boxes to choose our colours. Normally you mustn't use more than six different colours. You'll notice that in some cases we've chosen some colours more than once. When you look Below, at the simple design that we've ended up with, you'll see why - we want the same colour to appear more than once in our tartan. 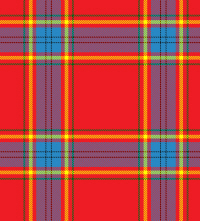 The formula for a tartan design uses the number of threads of each colour and the default number is 8 as you see from the box above. But that results in a rather boring design where all the bands of colours are the same width and we end up with more of a gingham tablecloth than a tartan. The number of threads can be increased or decreased by clicking the up or down arrow next to the number box or by deleting what's there and typing in a new number. As you do that, you'll see the design change automatically (if you've got the Auto-build button clicked). Normally you would only choose an even number of threads and CroftWeaver is programmed to go or down in twos. If we become a bit adventurous and start changing the number of threads as in the illustration on the left we get a much more interesting design as shown on the right. The colour sequence is exactly the same but the proportions are very different. When you get to that stage, you could go back and change some of the colours and see what effect that has on your design. Most tartans have about 250 threads in their design and you can see the running total of your design underneath the threadcount box (see left). You don't have to have 250 threads exactly - anything between 250 and 300 is quite OK. If you want to delete a colour, click on the red cross. 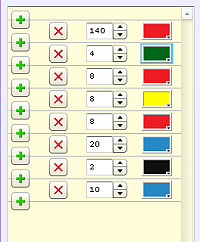 If you want insert another colour band, click on the green plus sign between the two colours where you want the insertion. Looking at the horizontal menu bar at the top of the screen (right), if you click Advanced you'll then see the threadcount box shown below which contains the half sett of the design. You'll notice that the number of threads tallies with the threadcount boxes shown on the previous page. If you want, you can go into this linear version of the threadcount and change the number of threads or delete/insert other lines or bars. 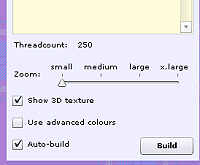 Insert the cursor where you want the change and type in the new threadcount. Colour codes. Most of the colour code letters are self explanatory: R is Red, G is green, Y is yellow etc. Those colours may have an L for Light or a D for Dark in front of them. K which is for Black (if we used 'B' for black it would be confused with Blue). T which is for Brown or 'Tan' so it doesn't get confused with Blue. N which is for Grey or Neutral so that it doesn't get confused with Green. The last menu item that we need to give thought to is File. New tartan: self explanatory. If you click that before you've saved your design, you'll see the grey window on the right. 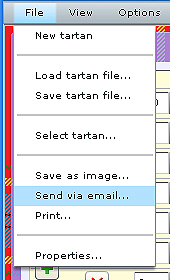 Clicking Yes will delete your tartan, clicking No will give you a chance to click File again and save your tartan. Load tartan file. 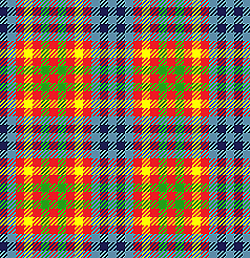 You'll see all the tartans you've saved and just need to click on the one you want. Send via email. This is the last important function that you need to look at. If you are entering a competition the To email box will already be completed and you only have to complete the remaining boxes and click Next. 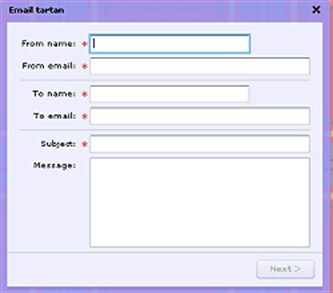 On the next window click Attach tartan file box and the software will generate the graphic. Press the Send button and that's the job done! Don't you wish you were a kid and could do without all these boring instructions? Welcome to what has been called "the best tartan design programme" on the web. We think that's a bit of an exaggeration but it's certainly the most simple and intuitive programme around. Youngsters starting at the age of 6 have picked it up within minutes. A marvellous example of that intuitive simplicity is that it was used by Russian students in St. Petersburg to design their city tartan without any instructions whatsoever. For those of us who're too dumb to be youngsters, here's a brief grown-ups' explanation! The simplicity of the programme and the fact that finished designs can be emailed wherever you like, makes it an ideal facility for schools (and their elders) to organise tartan design competitions. We can programme in the recipient email address and all the contestants have to do is click 'Send'. Let us know if that's of interest to you.